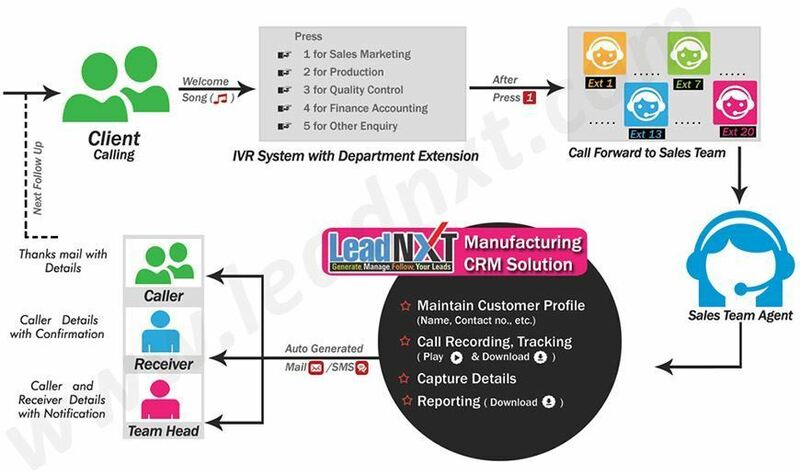 LeadNXT CRM Solutions is relatively for Manufacturing companies, it helps in boosting the productivity, streamlines the operations, reform workflow, enhances performance and profitability by catering smooth coordination between sales, management, and marketing and meet the demand. It coordinates with sales teams, to simplify the complex programs at the core of their business and boost productivity to improve the quality and other powerful advantages. It helps in meeting the industry requirements and accommodate improved manufacturing operations that driveability in the business, This system plays an important role in streamlining inventory management and improves marketing ROI. IVR Solutions - This system plays an important role in Meeting your desired specification through our IVR Solutions, This is highly efficient for corporate officThese IVR Solutions enable the callers to interact with the associate which guide you to proceed further, as per to your query. CRM Solutions - it represents all important features and practices for handling customers and their information. It offers most comprehensive features of unified communication, which constitutes auto attendant, call recording, call forwarding, quality monitoring and much more. It helps in tracking all business task, interaction, and communications in a single database to build vision from the data which is generated to help in managing the leads and opportunities.